To begin the restore process, do one of the following. In the displayed window, click Entire machine restore > Restore to Amazon EC2. Select the machine that you want to restore and click Restore to Amazon EC2 on the ribbon. Right-click the machine that you want to restore and select Restore to Amazon EC2. In this case, you will pass to the Account step of the wizard. Double-click a full backup file (VBK) or backup metadata file (VBM) in a file browser. 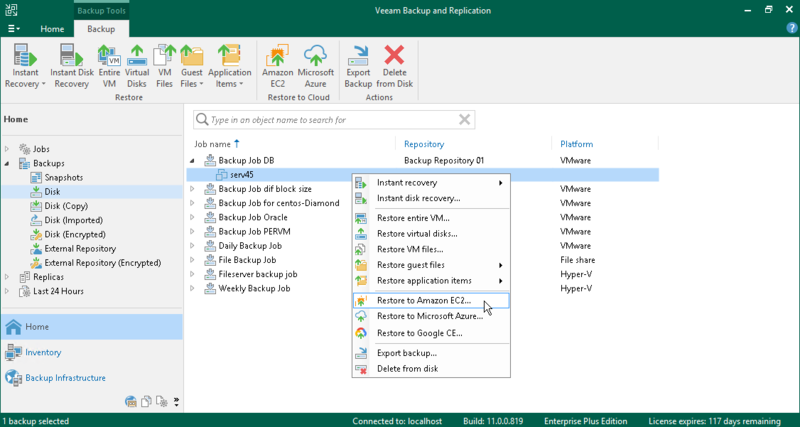 Veeam Backup & Replication will start its console. In the Backup Properties window, select the necessary machine and click Restore > Restore to Amazon EC2. In this case, you will pass to the Account step of the wizard.